So school is either out or winding down, and you are searching for some options to get away that are both close and affordable. May I recommend considering a visit to Hendricks County? We are a perfect getaway for family fun that is easy on the wallet and has enough to do for a long weekend, or extend your experience even longer by mixing and matching some of these suggestions for a Central Indiana excursion that will provide lasting memories. Before I get to our recommendations, it is always important to my family when planning a summer vacation to find lodging with a pool. With that in mind, check out this link to our hotel grid for a full list of properties with indoor or outdoor pools. Bring the sunscreen and shades and make sure the kids are ready as we have water parks, a trampoline park and more. We would suggest spending a day at Splash Island Family Waterpark in Plainfield, which boasts more than 4 acres of water fun including waterslides, a lazy river, an interactive children&apos;s play area and so much more. Then, hop on in for some more can&apos;t-miss family entertainment at Sky Zone Indoor Trampoline Park. Dunk basketballs, flip into foam pits or take in a game of dodgeball like never before in this 3D play experience. Finally for a unique family dining experience, we recommend the Mayberry Cafe on the Historic Courthouse Square in Danville. Get family pictures with the police cruiser out front, then enjoy endless reruns of the show on multiple televisions inside while enjoying food you swear Aunt Bee made. This is merely a sampling of all the family activities. Click here for other Hendricks County Family Fun attractions. Just Outside Hendricks County: Because Hendricks County is just minutes from Indianapolis, we recommend extending your visit by spending a day at the Children&apos;s Museum of Indianapolis. Tip: If you visit on the weekend, make sure to check out what children&apos;s activities the Hendricks County Parks and Recreation has planned. They offer interactive experiences virtually every Saturday, and the best part is their programs are always free! 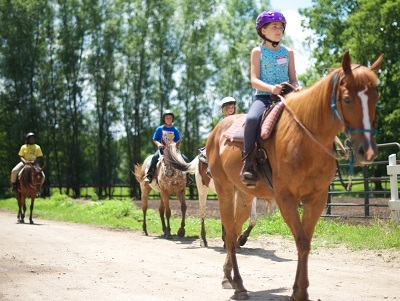 For the more venturesome family, Hendricks County also has you covered with horseback riding adventures, scenic hiking and biking trails and more. Natural Valley Ranch in Brownsburg includes 50 acres of picturesque riding trails for every member of the family. They even have a couple of options if you want to stay overnight on the ranch including their Cottage or Cabin. After spending so much time on a ranch riding horseback, you may want to head to nearby Avon and practice your cowboy or cowgirl shooting skills at Xtreme Laser Tag, which includes 4,000 square feet of multi-level fun. Finally grab your fishing pole, hiking boots, bicycle or all of the above and head off the beaten path to McCloud Nature Park up in rural North Salem. The park boasts 232 acres of mostly untouched nature. The views are breathtaking; the sounds are soothing and the experience is priceless. While you&apos;re in North Salem, you must make a pit stop at Perillo&apos;s Pizzeria, a true hidden gem with amazing outdoor seating. Click here for a list of more recreational activities in Hendricks County. Just Outside Hendricks County: Extend your visit by experiencing the new Go Ape Zipline & Treetop Adventure at nearby Eagle Creek Park. If your family is into the arts and culture scene, then you may have stumbled upon some of the best under-the-radar talent anywhere as Hendricks County has become a burgeoning arts district. Whether it&apos;s clay, paint, glass, confectionery or virtually any other medium, we likely have an artist that excels in it. If you are more into Indiana&apos;s culture and history, we have that covered, too. The easiest way to find many of these attractions neatly bundled together is by visiting the Rural Routes to Main Street Cultural Trail, a self-directed, self-guided driving tour that includes more than 30 stops in Hendricks and neighboring Morgan counties. Galleries, shops, restaurants and any other business that features local Indiana artisan products are featured along this trail. 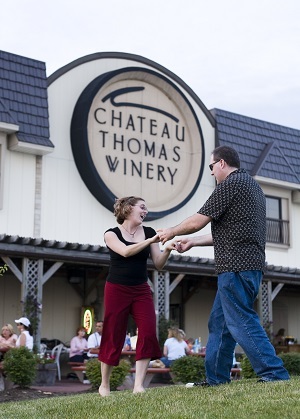 Locations include Gallery on the Square, Chateau Thomas Winery, Art Sanctuary, Bread Basket Cafe and Bakery and many more. Divide the trips by county, and a two-day adventure awaits. Click here for more arts and culture information. Just Outside Hendricks County: In addition to the Morgan County locations, you can extend your stay by visiting the Indianapolis Museum of Art. Tip: All the sites on the cultural trail are at least open 10 a.m. to 5 p.m. Thursdays-Saturdays. However, we would suggest visiting on the second Saturday of the month when eight additional locations join the trail and open their doors to the public including the Hendricks County Historical Museum, Hot Blown Glass and the Academy of Hoosier Heritage.